We've installed Tooway in some unusual places in the past and the one we did recently has to rank among them. It was for The Snowdonia National Park Authority; http://www.eryri-npa.gov.uk/visiting at their Warden's office site. 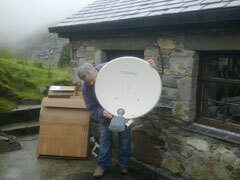 Owing to the location, broadband while needed had been unavailable to them until we installed a Tooway System. They now are able to get speeds up to 12 Mbps and this has made a big difference to operations at the site. We look forward to installing a second system to their new offices which are currently under construction in The Ogwen Valley in the near future.